R&B singer Pleasure P spent the majority of the past 12 months lying low after allegations of sexual misconduct with a child. Don't expect the new year to go the same way. The singer lashed out against his detractors via Twitter on Tuesday; presumably, the targets of his tirade were members of his former group, Pretty Ricky. "Mutha f---as talking bout let it go i aint letting sh-- go half the world think im something that im not yall dont know what that feels like," he wrote. "I had a year to prepare for war now war is about to begin if n---az thought it was over they got another thing coming hahahahahahaha." The diatribe began when the singer tweeted that he heard what he characterized as "the worst song ever" and asked his followers to guess who recorded the number. Pretty Ricky recently released a new track, "Cookie Cutter," that's been embraced relatively slowly, considering their past work. Last December, an anonymous source alleged that Pleasure P molested a young child, which the singer responded by calling the charge against him "vile" and "disgusting." A legal document that appeared online traced some involvement in the case back to members of Pretty Ricky's camp. The group denied any involvement in a statement to MTV News at the time. 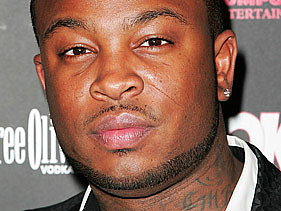 Pleasure P has been pursuing the party he feels is responsible, though he would not confirm that person's identity. After a tumultuous year, however, the Grammy-nominated Pleasure P appears to be ready to fight fire with hits. He sent his followers a new track, "She Likes," featuring LaToya Luckett, that appears to be slated for his sophomore set, Pleasure Principles. "We dont do it for the streets we do it for the sheetz lol what it izzzzzzzz," he wrote before posting the record.